Design for 2013 Nengajou, the year of the snake. Nengajou design for 2013 – year of the Snake. 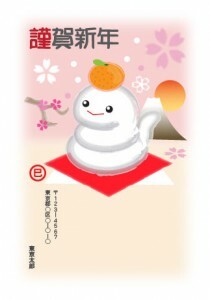 In Japan, it is custom to have Kagami Mochi （鏡餅）, 2 layers of round mochi rice cake, as a decoration for the New Year. In this design, the mochi rice cake is actually the Snake, which represents the year 2013. This entry was posted in Characters, Seasonal. 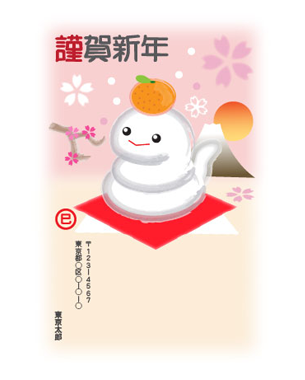 I like the design, colours are soft, effective representation of both year of the snake and the mochi rice cake!! Where can I buy the card? Thanks for the comments. The card currently is available in Japan for the New Year. I plan one day to create items for sale. Stay tuned!